Does every problem need a design solution? Okay, those old ketchup packets were kind of annoying to open, and yes, they were a little bit puny, but still, is this so-called “revolutionary” re-designed packet from Heinz really necessary? The new packet holds three times as much ketchup (about an ounce) as the other ones. That’s fine, but office kitchen drawers overflowing with the little pouches prove take-out joints are overzealous in handing them out. Will a bigger pouch just mean more wasted sauce? Size, of course, isn’t the only “innovation” here–the peel-away lid lets you squeeze out ketchup or use it as a dipping bowl. Why? 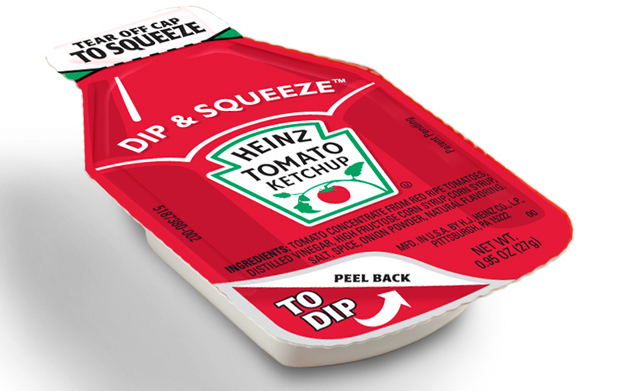 “Americans love Heinz Ketchup, and now the Dip & Squeeze product makes it easier and more fun for them to enjoy it on-the-go,” said Heinz Ketchup VP Dave Ciesinski in a press release. That’s right folks. This packet was specifically designed to make it easier to eat in the car. It’s like BlackBerry coming out with a steering-wheel-mounted keyboard. Heinz supposedly spent years developing the container–years! Their rigorous R&D even included user-testing in cars. Statistics are unclear on how many of the 100+ car deaths every day are caused by eating, but the National Highway Traffic Safety Administration says about 80% are due to driving distracted–and that includes fry- and nugget-dunking. While it’s clearly not Heinz’s responsibility to police people who might enjoy their savory accoutrement while, say, whipping around a convoy on the New Jersey Turnpike, it does come across as a potentially controversial distraction. Heinz representatives did not immediately respond to requests and calls for comment made early this morning. Heinz sells more than 11 billion ketchup packets every year, and is set to start releasing this new breed of highway hazards in the fall.